So I know that as far as blogging goes I've been kind of slacking. You try getting motivated when it's this lovely out. I mean, I've not been getting out in it as much as I would like...but it's still really hard to focus. Regardless, nails still need doing whatever the weather & mine REALLY needed doing so I thought I'd share what I do. I really enjoy mixing up what I do on my nails. I'm not so good at nail art or anything but I have a lot of fun & it makes me feel so much better about my gross hands. So my nail routine is not a big deal, I start of by taking off my nail polish with the Bourjois 1 second nail polish removal pot. I use a LOT of glitter nail polish. I LOVE glitter nail polish, I love holographic polishes & glitter and I just generally love the stuff. What I don't love is how hard it is to get off. I mean have you seen how hard it is to get off glitter polish. God it's a b***h. Seriously. But the Bourjois polish remover is really good. You stick your finger in, wait for a bit (a lot longer than a second but not for a whole minute or anything), wiggle your finger a bit & then pull it out. Once I've done this I like to use a hair oil on my nails. It's a heck of a lot cheaper than the nail oils & it does basically the same thing. I use the nSpa Treatment Elixir oil. This stuff is also really great on hair & actually come out of clothes if you get it on it by accident. So, after this I put on nail polish. In this case I put on a layer of white polish (Illamasqua Scorch) & then layered the Illamasqua varnish in Hemlock which is an amazing sheer, white, pink, green multi-crome polish. If you have vex eyeshadow by mac, this is like the polish version of that. It is so stunning. Okay, then i put on a top coat, then the glitter, then another layer of top coat, weird I know but that's how I roll. I've been using the ciate speed coat top coat. I got it on sale at beautybay & I like it more than any other top coat I've ever used. The only negative I can think of is the fact that it has a really slippery, thin handle so is hard to open....but that is what brothers are for. The last polish was the Topshop Rising Star glitter polish. I love this one so much, it has really tiny pieces of holographic glitter suspended in a practically clear polish. The polish also contains a few slightly curved star shaped sequins. I love the Topshop glitter polishes. I have 3, maybe 4 & they are all of a really good quality. 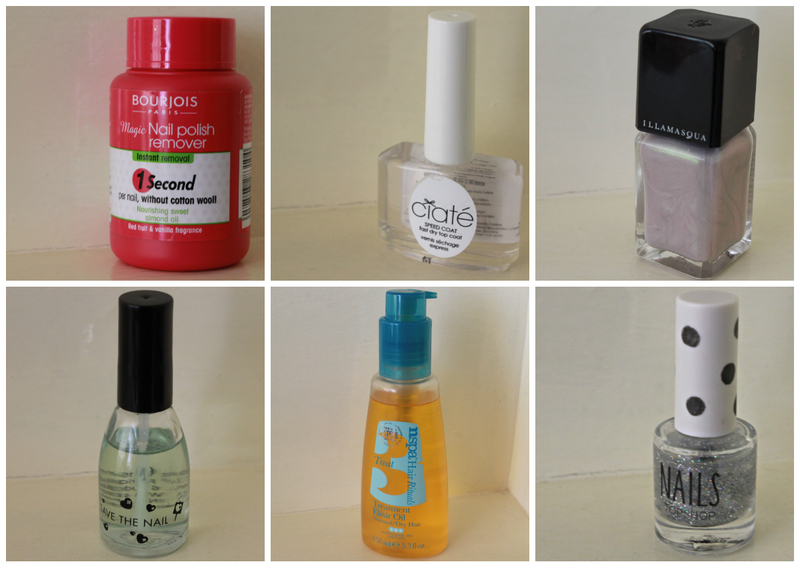 So.......there is my nail polish routine, so indepth right? Lol. Well that's what I do so hope it was interesting/helpful.